Probably no one exemplifies the Dark Side as well as the ironically named Karl Christian Rove! His role as The Joker has been a work in progress since his college days breakin into the campaign office of Illinois Treasurer candidate Alan Dixon to steal campaign letterhead to print fake campaign flyers. A classic chickenhawk, who maintained a student deferrment during the Vietnam War years, and protege of Watergate conspirator Donald Sengretti, Rove painted World War II bomber pilot George McGovern as a left wing peacenik! Rove later helped Swift Boat another war veteran John Kerry! Rove appropriately learned to dig through opponent's trash cans during the Watergate scandal. The master of rascist innuendo and scare tactics, Karl Rove engineered the smear of John McCain's 2000 presidential campaign with the allegation that McCain fathered an illegitimate black child. Rove was responsible for the terror warnings during the 2004 campaign, whenever John Kerry's poll numbers went up. 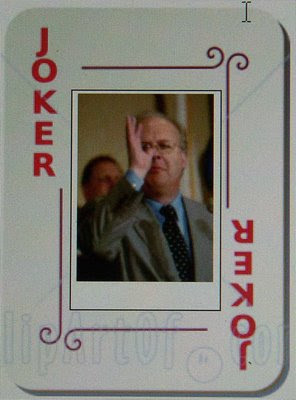 Karl Rove's pranks and scaremongering reached the level of war crimes with his organization and direction of the White House Iraq Group, beginning eight months prior to the invasion of Iraq. Karl Rove became the Joseph Goebbels of the Bush Administration, the Propaganda Minister who strove to convince the American public that black was white, and day was night, all apparent evidence to the contrary notwithstanding. Further, Rove helped leak the identity of the CIA operative Valery Plame, a federal offense if ever there was one, even if he did manage to avoid prosecution! Karl Rove helped engineer the dismissal of the U.S. Attorneys not proactive enough in prosecuting Democratic opponents.